The Core Team provides focus and guidance for the work of the Annual Conference in collaboration with the Bishop and Extended Cabinet. May invite other people to give needed input related to the fulfillment of the Conference mission. 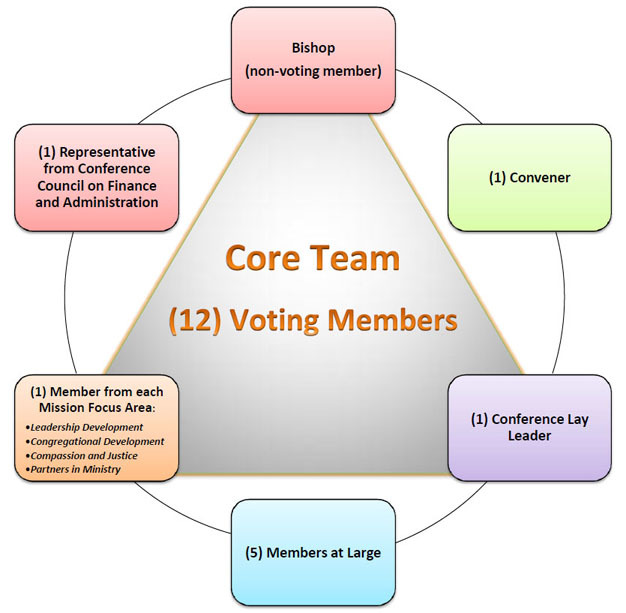 The Core Team shall have eleven (11) voting members who are nominated by the Conference Nominating Committee and elected by the Annual conference. The Bishop and the representative from the Council on Finance and Administration participate as non-voting members. Membership should be inclusive and reflect a balance between clergy and Laity. Staff resources (i.e., District and Conference Superintendents, Conference Treasurer and other program staff) may be invited, as needed, to the Core Team for consultation. However, no staff member is a permanent member of the Core Team. Work with CFA to determine resource allocation throughout the Annual Conference.